Rieju Century 125 is a cafe racer with the power to back up the agressive styling. The Rieju Century really is a motorcycle for all users that brings new class to the 125cc sector. A modern twist on a classic design with a proven high performance motor and sporty yet comfortable ride. Class leading European built 15CV 4 valve liquid cooled motor, Ø41 mm USD forks, dual rear shocks with preload adjustment, massive combined (CBS) wave disc brakes Ø285 mm front with dual piston calliper and Ø220 mm rear. LED lighting and indicators. An exclusive design – stand out from the 125cc crowd. 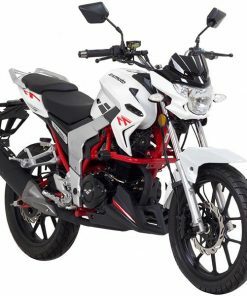 By purchasing this genuine Rieju Century 125 from Biking Direct, you are purchasing via an authorised Rieju distributor. We only sell GENUINE Rieju Products so you can have peace of mind. Whether its developing our own armour system, sourcing new and unique materials, thread or zips, or producing innovative products such as the Rieju Century 125, if there is a better way to do something the team is always striving to push forward and improve. Buy with confidence, buy with Biking Direct.